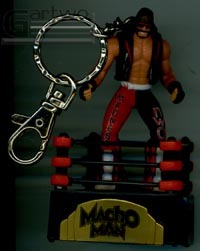 Toy Biz released 2 versions of these keychains: One that was just the figure by itself, and one in which the figure was glued to an electronic talking ring. 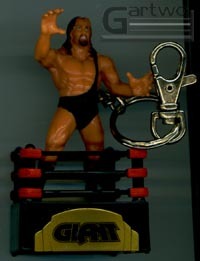 The ones glued to the rings are rather bulky, I can't imagine anyone actually using it to hold your keys and carrying it around all the time, but they make for nice collectibles. I'm not sure how many figures they made. I know of Sting, Hogan, Savge, Giant, Goldberg & DDP, but there may have been more. Possibly Luger, Hall and/or Nash? More pics to come as I get 'em!